Two cops, one an immortal pharaoh, one a Roman vampire. Their mission: stop a vampire conspiracy in modern-day Miami by any means necessary. GRAVEYARD SHIFT is available in trade paperback for the first time today! At bookstores everywhere! GRAVEYARD SHIFT is available in paperback today!!
. . . → Read More: GRAVEYARD SHIFT. Available in Trade Paperback for the First Time Today!! Hey, all. 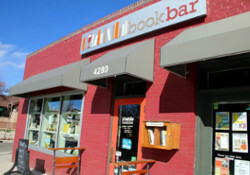 I will be at the Denver BookBar at 7pm Saturday, May 12th as part of SFWA’s Science Fiction and Fantasy Reading Series. If you’re in the local area, stop on by!
. . . → Read More: Denver Book Bar Science Fiction and Fantasy Reading Series. Looks like I’m confirmed for FanX, the Salt Lake City Comic Convention. It was a genuine blast last year. I’d never been to Salt Lake City before. This year, I’ll make a greater effort to get around to more of the city than just the convention center. I can’t wait! Greetings, True Believers! I made it as a finalist in the 2018 Colorado Book Awards. Holy cow! I will be participating in the readers series. The first of which is happening at the Denver . . . → Read More: Finalist! Colorado Book Award for 2018.